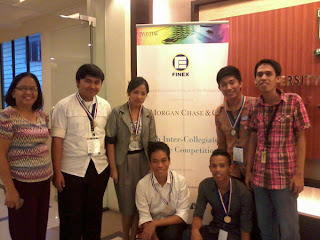 The University of Cebu’s string of Champions just keeps going as the University of Cebu LapuLapu Mandaue won first place for the Central and Eastern Visayas regions in the 14th Inter-Collegiate Finance Competition (ICFC) and ranked third nationwide next to Ateneo de Manila University that ranked first and the University of the Philippines Diliman that ranked second. A total of 86 colleges and universities participated in the eliminations held simultaneously last September 21. The Central and Eastern Visayas schools converged at the University of the Visayas in Cebu City. Other eliminations were held at the J.P. Morgan Chase & Co. Building in Taguig City for the National Capital Region and Southern Luzon schools; University of the Cordilleras in Baguio City for the Northern Luzon schools; Angeles University Foundation in Pampanga for the Central Luzon schools; University of St. La Salle in Bacolod City for the Western Visayas schools; and Xavier University – Ateneo de Cagayan in Cagayan de Oro City for the Mindanao schools. UCLM Commerce Dean Ms. Jessica A. Selisana said, “Our students proudly held their ground. They will join other finalists nationwide along with some students representing schools from other Asian countries for the finals.” The finals will be held at the Bangko Sentral ng Pilipinas in Manila on October 22. Schools from Hong Kong, Malaysia, Singapore, Guam, and Thailand are expected to participate. The ICFC is a project of the Junior Financial Executives Institute of the Philippines (FINEX) in collaboration with J.P. Morgan Chase & Co. as principal sponsor and AIM through the Gov. Jose B. Fernandez Jr. Center for Banking and Finance.